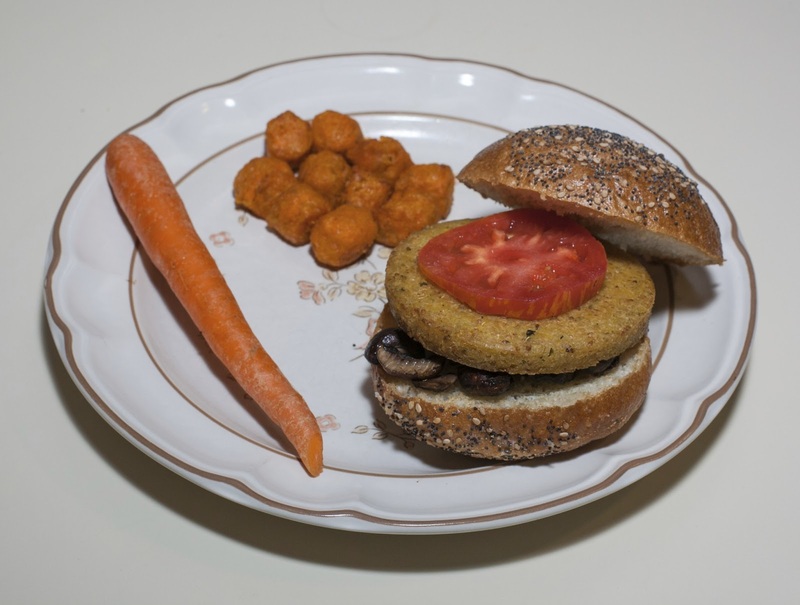 I found a new quinoa-based Qrunch burger and picked it up; it is already cooked and then frozen, and just needs to be heated on the grill, a toaster,or pan. It is vegan, soy- and gluten- free, and contains (mostly?) organic ingredients. It is made from quinoa, millet, and vegetables. I had intended to grill out tonight but I grill so rarely that I had trouble getting our grill going. Having had it in storage and perhaps having the coal briquettes stored outside (but in a plastic container) and therefore maybe picking up some humidity probably were the reasons I had trouble. Instead, I grilled the burger inside on a pan. I also grilled cremini mushrooms and served the burger with the mushroom and a slice of tomato on a bun. I heated some sweet potato frozen "tots" and had a filling dinner on the table. Wow, the burger was great! It was one of the best that I've had in a long time. It had an "authentic" taste, rather than simulating something it isn't. It really didn't taste like quinoa, millet, or vegetables, but had a filling, slightly creamy, and just unique good taste. I can't wait to try the other varieties of this Qrunch burger!